EB07 : Mystical Magus updated! BT13 : Catastrophic Outbreak updated! TD12 : Dimensional Brave Kaiser updated and completed! After a lot of work, I am announcing today that I will take some rest during the two next months. Not only as a choice but I probably will also be unable to update the blog daily with Cards of the Day and other news as I will not be at home (or too much busy) until the end of August. That being said ! I will still try to update the whole website with the upcoming Trial Deck 12 (Dimensional Brave Kaiser), EB07 (Mystical Magus) and BT13 (Catastrophic Outbreak) if needed ! I will also try to be available during the release of KeroKero Aces. Until then, I wish everyone to spend the best summer as possible in the wait of September ! See ya’, buddies ! Après un bon paquet de boulet, j’annonce aujourd’hui que je vais prendre du repos pour les deux prochains mois. Ce n’est pas seulement un choix mais je serai aussi dans l’incapacité de mettre à jour le blog quotidiennement avec les Card of the Day ou autres news. Je ne serai effectivement pas à la maison, ou bien trop occupé – ce jusqu’à la fin du mois d’août. Cela étant dit ! J’essaierai tout de même de mettre à jour le site avec les prochains Trial Deck 12 (Dimensional Brave Kaiser), EB07 (Mystical Magus) et BT13 (Catastrophic Outbreak) si nécessaire ! J’essaierai également d’être disponible durant les sorties des KeroKero Ace. Jusqu’à ce moment, je souhaite à tout le monde de passer le meilleur été possible d’ici septembre ! Tchao les amis ! [AUTO]: [Put this unit into Soul] When this unit boosts a « Silver Thorn » Vanguard and the attack hits a Vanguard, you may pay cost. If paid, look at the top 2 cards of your deck, select up to 1 « Silver Thorn » unit from those cards, and put it into soul. Put the remaining cards to the bottom of the deck. A servant of « Luquier » who was given a Silverthorn in celebration of the new ownership at « Pale Moon ». She is a user of Psychokinesis, which allows her to move objects without using her limbs. Though she looks human, she was originally a magical beast, such as a squirrel, not a humanoid. When she was seriously injured due to an accident backstage at the circus, on the verge of death, she was given the power of the Silver Thorns on a whim of Luquier’s, allowing her to survive just in time. Due to the incredible surge in magical power, she became incapable of returning to her original form, but she didn’t mind, instead dedicated her entire life to accompanying and attending to Mistress Luquier, who saved her life. She was the first of the servants to notice what happened to her mistress, and remains quite anxious to the changes in her, making her more cautious. She has cried as she has watched her friends lose their freedom with each day, forced to follow her mistress. So now, she’ll wait, refusing to shed any more tears. She waits for the day an unseen hero will arrive, and turn her mistress back to the gentle person she was before. The general name for the servants who have sworn eternal loyalty to their mistress, Luquier, who has bestowed upon them Silver Thorns and a fraction of her own power. Their circumstances differ, as some of them came to her, desiring servitude, while others were forcefully converted to her side by the use of her « Charm ». Those that became her servants are able to use a fragment of the same magic as Mistress Luquier, provided there is one major restriction: They must follow her orders with top priority, and fulfill them as soon as possible. [AUTO]:[Choose a «Dark Irregulars» from your hand, and discard it] When this unit is placed on (GC), you may pay the cost. If you do, choose one of your «Dark Irregulars» that is being attacked, and that unit cannot be hit until end of that battle. The generic term for those who have had the mark of high ranking demons carved into their bodies. Through a ritual, a being of the Demon World can give a portion of their powers to others by carving seals and emblems, that represent itself, into the body of others. It’s said those that don’t recognize they would be chosen for it, such as the weak or feeble minded, are the ones most commonly chosen. Reasons for becoming a servant other than « Gain greater spiritual strength and force of will » or « Gain power equal to or greater than that of their master » don’t exist. [CONT](VC) Limit Break 4 (This ability is active if you have four or more damage):During your turn, your front row « Link Joker » get [Power]+3000 for each of your opponent’s locked units. [ACT](VC):[Counter Blast (2)]Choose one of your opponent’s rearguards in the back row, and lock it. He is the commander of the advance forces of the invaders, « Link Joker », known as the « Star-vaders », who is in charge of the invasion of Dragon Empire and Dark Zone. Obsessed with efficiency more than anything, he is fine with plans that involve sacrifice and destruction, as he’s a cool-headed warrior who won’t hesitate with a brutally cruel plan, if he judges it the most reasonable course of action. He is one of those who chose to accept the power of « Void » of his own free will, but because nothing he does seems to have any feelings or emotions to it, it isn’t clear if his sense of self remains. Also, he never opens his mouth, except when to issue commands to the entire army, so it is a voice that is rarely heard, and when it is, it is an emotion-less almost mechanical, non-living voice. There is neither joy nor sorrow nor hatred nor fear in it. There is nothing inside him. New orders from the main force are his guiding principles. The hollow dragon of the black rings begins to act, accompanied by the embodiments of the void that are far more terrifying than any evil or any sort of justice. [AUTO](VC) Limit Break 4 (This ability is active if you have four or more damage):[Choose three of your rear-guards with « Revenger » in its card name, and retire them] At the end of the battle that this unit attacked, you may pay the cost. 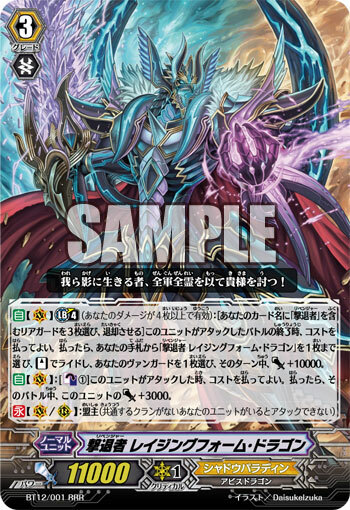 If you do, choose up to one card named « Revenger, Raging Form Dragon » from your hand, ride it as [Stand], choose your vanguard, and that unit gets [Power]+10000 until end of turn. [AUTO](VC):[Counter Blast(1)] When this unit attacks, you may pay the cost, if you do, this unit gets [Power]+3000 until end of that battle. A warrior of the « Revengers », who have vowed to protect the Sanctuary from the clutches of the invaders. He is an ancient Dragon Warrior who looks like he is the embodiment of wrath and rage. He was a great knight who served in the days when « Phantom Blaster Dragon » reigned as the Guardian Dragon, so when Phantom Blaster fell, the two of them parted ways. However, he ended up getting taken over by the power of darkness that overtook him when he parted from his friend, he turned into an Abyss Dragon, he found himself completely disillusioned with the entire world and nearly let himself be killed by soldiers of the Empire, but was saved by « Soul Saver Dragon » who has become the next generation’s Guardian Dragon. Afterwards, he swore he would one day again protect the Sanctuary, and fell into a seemingly eternal slumber in order to heal the wounds inflicted to his body and soul. However, upon awaking he chose the path that lead to him becoming a shadow, not a knight of the Guardian Dragon once more. It might be his way of admitting he can’t entirely refuse the darkness. While the darkness is darkness, he has decided to conquer despair with despair. To all the disasters that would befall the sanctuary, this raging shadow will grant them despair equal the despair they would give others. [AUTO](VC) Limit Break 4 (This ability is active if you have four or more damage):[Counter Blast (2) & choose two of your «Shadow Paladin» rear-guards and retire them] At the beginning of the guard step of the battle that this unit is attacked, you may pay the cost. If you do, choose one of your opponent’s rear-guards that is not boosting or attacking, and retire it. A Dark Elven magical scholar who lives every day without a care. Although she frowns at getting dragged into battle, she has absolutely zero tolerance of anyone who would be insubordinate to her in the realm of research. Because she has the sort of personality that doesn’t consider good or evil while researching, she has a habit of announcing a wonderful invention in several places, and then things go to hell when someone tries out the forbidden curses she came up with, causing a terrible incident. While decorated and honored with awards, she was imprisoned at the same time, and has not been heard from for a long time. While it was ultimately revealed that she joined the Shadow Paladins, the circumstances behind it are unknown, just merely she decided to become one of the knights of the shadows that have chosen to vanish from the official annuls of history. Even though the times and her circumstances have changed, she still continues to study without much concern. This group of people with checkered pasts may unexpectedly be a cozy place for her. [ACT](VC) Limit Break 4 (This ability is active if you have four or more damage):[Counter Blast (1) & Choose one of your «Pale Moon» rear-guards and lock it] Choose one «Pale Moon» from your soul, call it to (RC), and that unit gets [Power]+5000 until end of turn. [CONT](VC):If you have a card named « Silver Thorn Dragon Tamer, Luquier » in your soul, this unit gets [Power]+2000. This is Luquier after being twisted by the power of the avatar of Void, « Link Joker ». Because she was in the middle of a performance in a coastline city, she was caught in the midst of a fierce attack by the forces of « Link Joker » after they came ashore and began their invasion of « Dark Zone ». Her flexible and composed aspects that filled others with smiles simply vanished, replaced by an extremely haughty and unjust way of speaking and acting that has resulted in many considering her an utter tyrant, and she is now fittingly called « The Mad Queen ». Anyone who refuses to follow her is forcibly placed under the control of her magical eye – its power now completely out of control, and as a result has taken control of Pale Moon by her own hands. « Those who follow me will know pleasure from their mistress, while those who dare oppose me shall know inescapable slavery. » As she swore this in a voice so cold that it made people run, her hair turned the color of red blood. She smiles with an insane, seductive smile as the stage is colored by black energies. The madness of her majesty has not yet ended.